I normally avoid movie posters, but Tim Roth's face in this one was too priceless. 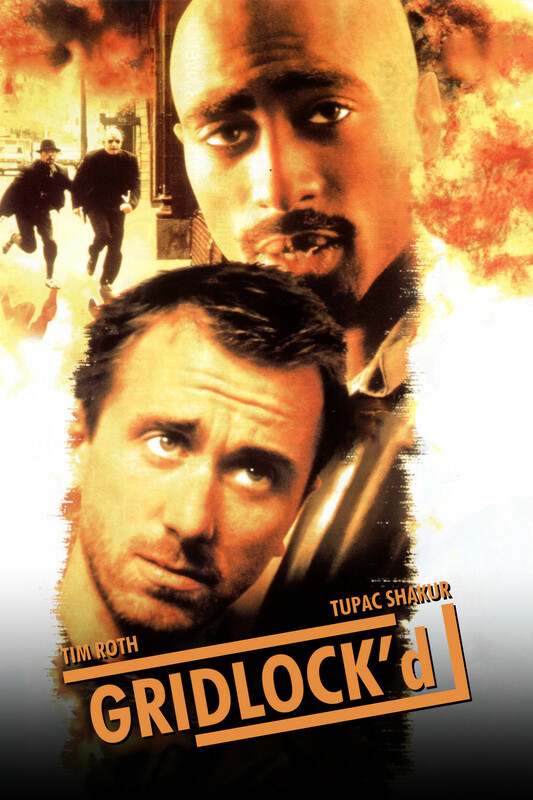 Best friends Cookie (Thandie Newton), Spoon (Tupac Shakur), and Stretch (Tim Roth) share two passions: music and heroin. Things seem to be going well until one New Year’s Eve when Cookie overdoses. Fearing for her life, Spoon and Stretch rush her to the ER. Having been sufficiently scared, Spoon and Stretch decide it’s time get checked into rehab and kick the heroin habit. It sounded like an easy enough plan until they ran into governmental bureaucracy and an angry drug dealer (Vondie Curtis-Hall). Gridlock’d was a dramedy that also has the distinction of being Tupac’s last film; he was murdered months before release of the film. Between the Tupac and Roth, it’s fairly obvious from the beginning that Tupac was the straight man. Many of the escapades in the movie are the result of Stretch having brought something upon the both of them; Vondie Curtis-Hall (also the director) had a feud with Stretch because Stretch tricked him into buying a brick for $83 and insulted his mother. One of Gridlock’d’s main problems was some serious pacing issues. The scene towards the end when Spoon and Stretch got chased out of a rehab center started off absolutely hilariously. However, the problem was the scene dragged on just for a tad too long, and thus ruining the humor it started with. On the other hand, right before this scene, Stretch casually mentioned that he was HIV positive. It sounded like that was supposed to be another subplot the movie was originally going to explore, but there was no other reference to the fact before or after that one instance, and thus nullifying any chance of related drama. For the purposes of this movie, I think the acting was adequate. The only problem I had was with Tim Roth; here he probably gave the weakest performance I have seen him give. Roth was playing a ghetto-wannabe white American loser from Detroit, yet I did hear his native English accent peak through on occasion, and that was fairly distracting. That’s surprising since he was a really convincing American in Deceiver. On the other hand, Tupac did a very good job as Spoon; in a move that appears to have been for the sake of political correctness, Stretch was the more stereotypically “ghetto” one between the two. Nonetheless, ultimately Gridlock’d was a movie less concerned about individual characters than it was with situations that are much larger. While it was not really a bad movie, I can see why Gridlock’d barely broke even at the box office. It was a dramedy that did not balance the drama and comedy as well as it probably could have. Still, I think Gridlock’d is probably the first entry I have in my list of the best movies nobody saw. I actually liked this movie a lot, and thought that both Roth and Shukur had a lot of charisma together in this. The issue of his langauge never really bothered me. I just thought he was a white guy from Brittian who wanted to sound like his one black friend. The pacing and plot were an issue but Tupac showed he could be a good lead. It’s a shame he died. The acting world lost a talented person. I agree that Tupac’s acting was really good. I felt barring Roth (who actually is a very good actor in other movies), the acting in Gridlock’d was tough to fault as Tupac delivered a pretty solid performance.